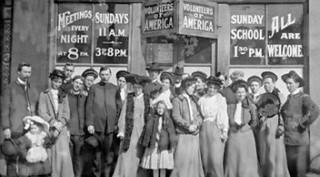 Since 1896, Volunteers of America has gone where no others go, and reached out more inclusively to all people in need. We do not look away. Instead, we open our arms…and change lives. For 123 years, we have led the nation in transforming the lives of America's most vulnerable, including the chronically mentally ill, veterans, at-risk youth, the frail elderly, men and women returning from prison, homeless individuals and families, people struggling with addiction, and those with disabilities. Today, our nonprofit human services organization includes nearly 16,000 paid professional employees passionately dedicated to helping all those in need rebuild their lives and reach their full potential. Our wide range of services, much-recognized for their innovation and success, touch almost 1.5 million people in over 400 communities in 46 states, as well as the District of Columbia and Puerto Rico. Every day, we combine deep compassion, highly effective programs, and an unshakable belief in each person's innate health and strength, to achieve what many consider “impossible."